Use Public variables to view and set global variables that apply to all provisioning templates. Such variables are used to customize template filenames to copy, paths to install to, or IP addresses to export files from. User-defined variables (variables that apply to only one template) take precedence over public variables. On the toolbar, click Tools > Public variables. To add a variable, click Add. In the Search value box, type the item you want to add as a variable (for example, CoreIP). Use quotation marks around names with spaces. Names are case-sensitive. In the Replacement value box, type the value you want as a replacement (for example, if the search value is CoreIP, type the IP address you want to replace CoreIP). You can use most values from the core database. Use quotation marks around values with spaces. Values are case-sensitive. String: An alpha-numeric string value. Database value: A database ID string, such as Computer.Network. "NIC Address". Sensitive data: A value to be encrypted in the core database. Database value lookups are handled by adding a ldbnf: prefix to the Replacement value. The database table and key pair can then be used to look up a specific entry in the core database. 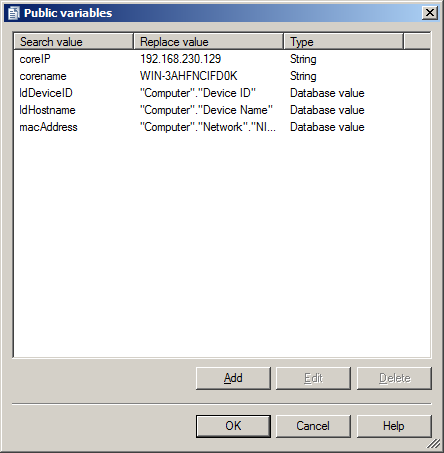 The ldDeviceID public variable that is configured by default is an example of how to add a database value.